Yesterday, hundreds of people clicked on our post about black Confederates. One of those people, a friend of mine recently of Charlottesville, even watched the segment from History Detectives we linked to and, whaddya know, she recognized a photograph of her own relative! That’s him seated there with his giant sword, his hat at a cocky angle. An officer in the 57th Alabama Infantry, his name was John Wallace Comer. (Comer’s younger brother later became governor.) The man standing behind, meanwhile, hat in hand, is Burrell, Comer’s presumably enslaved servant. Although the source of this striking photograph is likely the Comer Family Papers at the University of North Carolina, my friend remembers it clearly from back home in Alabama. She reports that family legend has it that when Comer was injured on the battlefield, Burrell braved enemy fire to drag him to safety. Having watched the History Detectives and read about black Confederates, she now wonders whether the old story is true. And what does it mean that her family has chosen to remember Burrell primarily as a war hero rather than a slave? “We are willing to aid Virginia’s cause to the utmost of our ability. 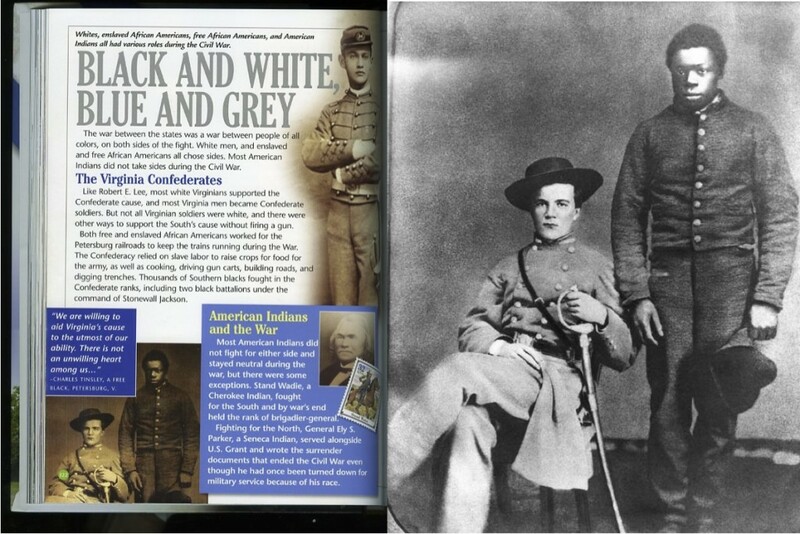 There is not an unwilling heart among us.” — Charles Tinsley, a free black, Petersburg, V.
While that quotation is genuine (if not at all representative of free blacks in Virginia), it is not relevant to the image of Burrell, who was neither free nor a soldier. And yet the image’s placement—absent any kind of caption—argues exactly the opposite! Seeing the image again has motivated my friend to dig deeper into that story, and I wish her luck. Perhaps the truth will surprise us all.